Now that I’ve been at this blogging stuff for a while, many of you have commented asking for Feng Shui advice and clarification. It’s great to see how you, my Readers, are integrating the wisdom and beauty of Feng Shui into your homes. Keep building that good energy! There’s so much information on the subject available that folks often express confusion and frustration with deciding which advice to follow. It can seem like a lot to decipher, but remember that my commitment is to help each Reader understand and utilize Feng Shui basics in their own life, so your Comments after any post are appreciated and will be answered. Like learning any new skill, we all gain insight and competence through not only the gathering of knowledge but the application and evaluation of that knowledge. Each person has their own individual energy that interacts with the energy of their home. Therefore, the primary thing to remember is that Everything is Energy. Make your decisions with a basic understanding of Ch’i – the vital energy that enlivens us and everything around us. When you tap into how things “feel”, their energy and how it interacts with yours becomes much more apparent. Then you will be on your way to a greater appreciation and understanding of Feng Shui. To help you increase your skills, here’s a few basic Feng Shui questions you have shared followed by my answers. Reader: I’m having issues with everything – my health, job and love life. Help! Download your FREE copy of Feng Shui Clutter Clearing Tips. Carol: It’s great that you are interested in using Feng Shui as a part of your plan to improve your life. I suggest you start with two Feng Shui tools: Clutter Clearing and the Bagua Map. There is extensive information on both topics on my website. 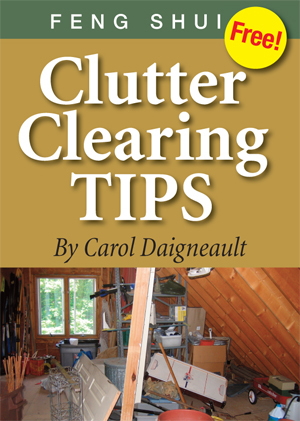 Clutter clearing will help to get stagnant Ch’i moving in your space and your life. The Bagua Map will allow you to consciously engage that energy to support you toward improvement of troublesome situations as well as accomplishment of specific intentions. I offer two free Downloads: Feng Shui Clutter Clearing Tips and my own Feng Shui Bagua Map. They provide the basic information you need to get started. Both have simple instructions that are easy to execute in your home. Using the information in either, of even both, of these free publications will help you to start to look at your home from an entirely new perspective. Reader: Are you supposed to have plants in your bedroom and bathroom? I have read yes and no in both rooms. Carol: You have asked a question that describes how tricky it is to make blanket statements about Feng Shui. First of all, during my Feng Shui training I was taught, “If it ain’t broke, don’t fix it.” In the bedroom, if you are sleeping soundly and waking feeling rested and refreshed, I would encourage you to continue with what you are doing. Next, Feng Shui is about Ch’i energy and how that energy interacts and either supports or depletes each individual. There in lies the challenge, as each individual has their own specific needs. That is when we should observe our environment, “feel” what areas are most desirable to us and which are not, and make changes (using basic Feng Shui principles). Do this when you are not totally in love with some part of your surroundings. This includes not only décor but calls for maintenance and organization as well. I’d also take a look at which Bagua areas these rooms are in and evaluate whether your life is going as you’d like in that area. If there is a jungle of plants in a bathroom that lies in the Wealth and Prosperity gua and finances are in a jumble, perhaps the plants should be thinned out a bit! Reader: I recently bought a set of candle holders of two individual hands, but a Feng Shui professional advised me to immediately get rid of anything in the form of palms or hands as it does not bring good Feng Shui. Is she right? Perhaps the consultant practices the BTB school of Feng Shui which utilizes Buddhist mantras and hand gestures and your hands’ position may have conflicted with that teaching. If that is not your practice, then the symbolism they apply to the hands would not be generating a similar response for you. Overall, I am not aware of a blanket “never use hands” rule. In general, if you love an item, it is providing beneficial Ch’i to you and can be incorporated in some way into your home. Reader: Something I can’t figure out is wall art. We had my photo art of the sea in our bedroom. Later I found out that was bad Feng Shui. I’m not sure what to do since we “love” the sea. Carol: Art is a personal preference, but its symbolism must be taken into account. The bedroom is the most Yin space in our homes. This means it is best if it’s the most quiet, dark, calm, restful, inactive and tranquil of any other room. If a picture of the sea embodies a very peaceful, restful Yin feeling, then I would suggest you try it in the bedroom. Here are two examples of images of the sea that I find very soothing. In contrast, a ship crashing along a lively, stormy or rough ocean is better placed in a more Yang setting such as a Living Room, but only if its message is one you endorse. The formula for a harmonious bedroom in Feng Shui includes a balance of the Five Elements, attention to the area of the Bagua Map the room occupies, bed in the Power Position, smooth Ch’i flow and living with what you love. If you have no issues with getting a healthy night’s sleep, keep the photo art you have. Should there be problems with resting properly, you can start to decipher what is causing the imbalance using the many tools of Feng Shui. Reader: We just bought a new house. my bedroom is upstairs and just below it there is the kitchen. Is that a bad thing, and what can I do for it? In Feng Shui, there are many uses for a faceted crystal. Carol: My question to any Client regarding their bedroom is, “How are you sleeping?” If there are no sleeping issues, I’ll inquire about the occupants’ general health. Feng Shui is a multi-layered practice and very individualized. Kitchens are Yang or active energy. A bedroom over this shifting energy influences some folks’ sleep and not others. An empowering recommendation for bedrooms is to put your bed in the Power Position and avoid putting the headboard on a wall that adjoins a bathroom. In your situation, you can make sure your bedroom feels grounded and stable. Landscape art, Earth tones and a rectangular carpet are all suggestions to consider for this space. Also add a 50mm faceted crystal to the center of the room for balance. Reader: Unfortunately red tape in any form is not to be found where I live. I wonder if I could use a red hairband instead to put on the pipe below the drains? Red tape can be used to symbolically anchor a corner or close a drain. Carol: As mentioned in my post on Toilets and Drains, a piece of red tape can be applied to the exit drain of any sink to signal Ch’i to symbolically remain in the room rather than constantly exit through the drains. This Reader has improvised an equally viable option. In modifying any Feng Shui recommendation, the key is to state your intention when using the alternative. In this case, the auspicious Feng Shui color of red was also adopted. Well done! For those of you in search of red tape, try this source. I’m sure you are starting to see that practicing Feng Shui is not as black and white as you may have originally thought. Being flexible and filtering your Feng Shui knowledge through a lens that takes your personal situation into account is imperative. Of course, there are likely to be times when the additional input of a Feng Shui professional will be invaluable. Contact me if you are at that point, and we can plan a telephone consultation to suit your needs. 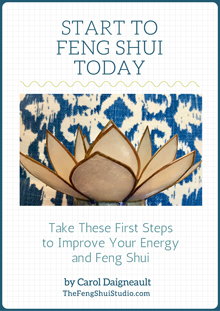 What are your Feng Shui questions and experiences? Let’s work together to understand and share this beautiful and transforming art to improve our own well being as well as that of the world around us. No need to fear Jess. Keep it clean, in good repair and make it a haven for relaxation and beautification. I suggest you restructure your thinking. Would you prefer to not have a bathroom? They certainly perform an essential and much appreciated function for us all! Your first easy step is to keep the toilet seat down then improve from there. Make your bathroom your new Feng Shui energy magnet. Let me know how you do! In fact, I’m recalling that during my training one of the other students was a flight attendant. She wanted to get the assignment of flying to London so she put a London travel guide on the top of her toilet tank which was in her Helpful People and Travel gua. In just a few weeks she got the call and was London bound!